Hello there! Guys, there’s nothing better than some good old spring baking. 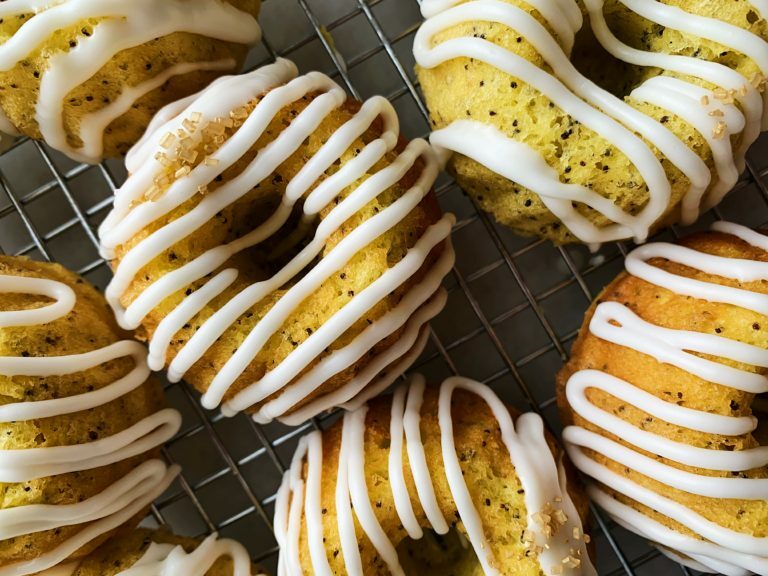 And fewer things are more perfect for spring than a Lemon Poppyseed Bundt Cake. Now, you guys know that I like to bake from scratch. It’s my jam, it’s my hobby. This isn’t a scratch recipe per se. Basically, it’s a doctored up cake mix. It’s definitely easier than making a from scratch cake, and I know that appeals to a fair amount of bakers out there. Plus, when you’re baking a full Easter dinner, sometimes it’s easier to whip up a quick dessert. Amiright? So let’s talk about this bundt cake. This is a classic straight from my grandma’s recipe box. I love that it’s simple, easy, and full of flavor. Everyone who tries it loves it! You start out with a lemon cake mix, then add a box of vanilla pudding. Except don’t grab the sugar and fat free box from the store like I did. Get the instant, original box of vanilla pudding. After that, you’ll just need some sour cream, eggs, butter, and poppyseeds (along with a few minor things like vanilla) and you’re set! 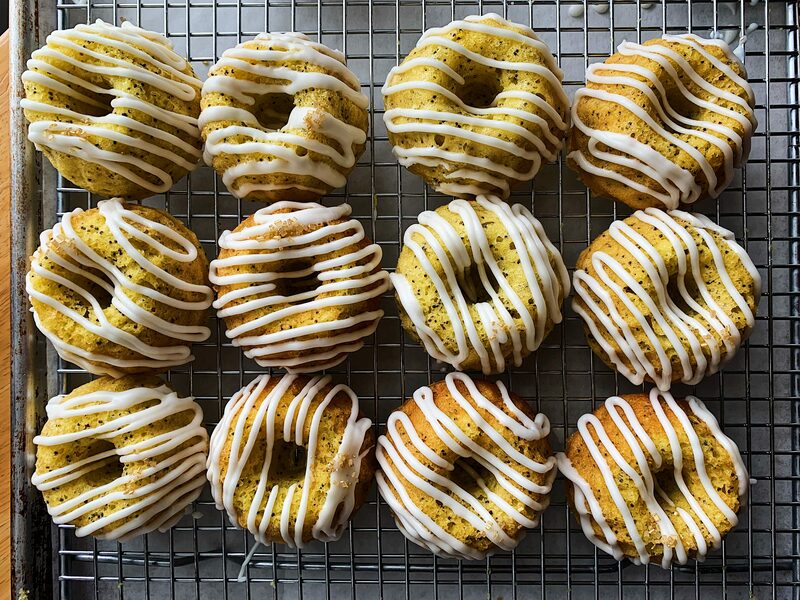 Let’s get going on this Lemon Poppyseed Bundt Cake. 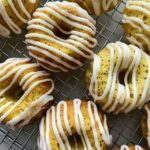 I used a mini bundt cake pan for these, but you can put this in a regular bundt pan. You’ll just need to bake it longer. No need to worry, I will note this in the recipe. When it comes to making bundt cakes, the most important thing to do is make sure your cake pan is well greased. You can use a thin spread of softened butter followed by a thin coat of flour, just make sure it gets into all the nooks and crannies of your cake pan. In this last batch, I used Baker’s Joy spray (non-stick spray that contains flour) and it worked really well. I do have darker non-stick type bundt cake pans, so they do tend to come out easily. Ultimately, you know what your bundt pan is like and the kind of grease that it likes. Just make sure you do it well! Here’s another quick tip when making a bundt cake: after filling the pan with batter, lightly give it a tap or two on your counter to help the batter settle into the grooves. Then pop it into the oven and you’re all set! If you’re planning on making mini bundt cakes, you may have to adjust baking time accordingly. Since there are so many variations in mini bundt cake pan sizes, I would recommend doing a test bundt cake so you can get an idea of how much batter to fill in each cavity and how long to bake it. I used this Wilton Mini Bundt Cake pan. It only took 2-3 tablespoons of batter to fill each mold and they took about 12 minutes to bake. The recipe made about 32 mini bundt cakes, if that gives you an idea of how you can tackle this recipe with your mini bundt cake pan. If you’re making it in one large bundt pan, you’ll have less to worry about! I really hope you like this recipe! These are the perfect cakes for your Easter dinner. Light, moist and refreshing! Preheat oven to 350 F. Grease a mini bundt cake pan or one large bundt cake pan, depending on what you're using to make the cake. In a large bowl or the bowl of your stand mixer (fitted with the paddle attachment), mix together the cake mix, instant vanilla pudding, and poppyseeds. Make sure to break up any large clumps of dry ingredients. In a separate bowl, whisk together eggs, sour cream, water, and vanilla extract. You don't need to make sure it's evenly incorporated, just give it a whisk or two to break up the eggs. Add the wet ingredients to the dry with the mixer running on low (or just whisk by hand). Add the melted butter and mix until combined and there are no dry clumps of flour. Give one final stir by hand and place the batter in the cake pan(s). Bake until a toothpick inserted into the cake comes out with a few moist crumbs attached. If you are using a mini bundt pan, it'll be about 12-15 minutes depending on the size of your bundts (see note). If using a regular bundt pan, the bake time should be about 35-40 minutes. Remove the cakes from the oven and allow to cool for 10 minutes before inverting them onto a cooling rack. Allow to completely cool. In a medium bowl, mix together powdered sugar, melted butter, milk, and vanilla extract. Drizzle over the cakes before serving. Enjoy! Since there is so much size variation with mini bundt pans, I recommend doing a test cake before you fill all the cavities. You will have a better idea of how much batter it will take to fill them properly and how long to bake them.